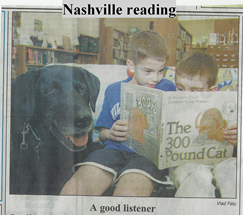 Two boys read "The 300 Pound Cat" to Nashville, a Reading Education Assistance Dog, at the Mary Edwards Library in Willington. The program is designed to help children develop their reading skills. Nashville lives with TOJ members Susan Gagnon and Ted Urbanski.